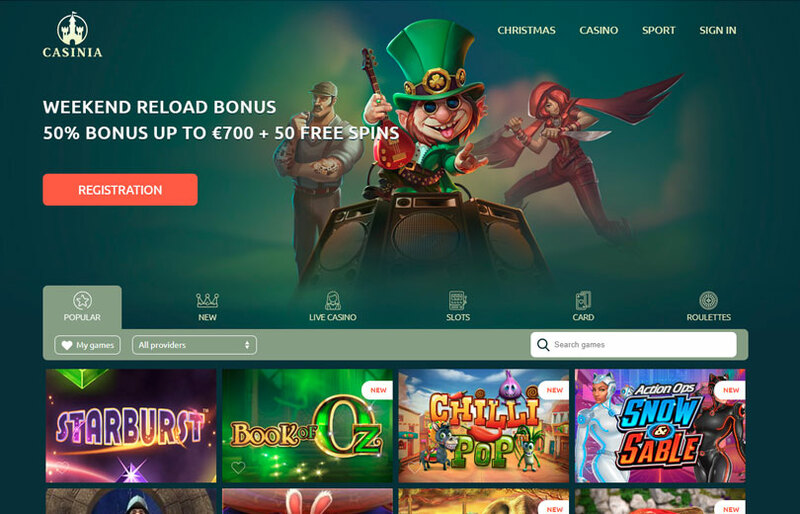 Casinia Casino launched only two years ago, which was in 2017. They are a popular choice among players, and there is a lot of positive things to say about them from other affiliates. Their website is being operated by Araxio Development N.V., and they are owned by Tranello Limited. They have a license in the jurisdiction of Curaçao and have been tested by TST. Browsing the web for a casino to look for an interesting welcome package is always a great thing to do. Welcome bonuses that casinos offer makes it really fun for players because they can play for a longer period and with more money, as well as with free spins in some cases. This is so much better than just playing with a simple deposit. Are you a new player? Then you can get up to €500 in bonus money and a total of 200 free spins! Casinia Casino will match your first deposit with 100%, which means you will get €500 if you deposit €500. If you deposit €100 you will get €100, it’s as simple as that. The minimum amount you can put in while using the bonus is €10. If you’re a fan of using your mobile phone, there might be a chance that you’re a fan of playing casino games on it as well. All users at Casinia can play on their mobile devices. It’s fully optimised for it so the experience will be more than great! Are you a regular casino player? Then you know how important it is with a good selection of payment options. If there is only a couple of methods available in the casino, you won’t really come far. Of course, if this is visa and Skrill it helps a lot, but you have to think about all the players in the casino at the same time and the country they are from. People prefer different methods, and that’s why it’s important to have a decent selection of options available when it comes to payments. We think you will be happy to hear that Casinia has over 10 payment providers. These are QIWI, Zimpler, Boleto, Klarna, Multibanco, Paysafecard, Neteller, Skrill, MasterCard, Visa and normal bank transfer. You can find frequently asked questions on their website if you need help with typical problems that might occur in an online casino. Should you not find a way to resolve it, you can feel free to contact live chat at any time during the 24 hours each day. Do you prefer to send an email instead? Then you can do that. You can also contact their phone support if that’s a better choice. Vikings, Cazino Zeppelin, Showdown Saloon, Space Wars, Action Ops: Snow & Sable, The Wild Chase, Tiger’s Claw, Crystal Queen, Da Vinci’s Treasure, Samba Carnival, Book of Aztec, 20 Diamonds, Lost Relics and Hot Fruits 20, are just few of the titles in the casino. PariPlay, NetEnt, Big Time Gaming, Red Rake, Ezugi, Play’n GO, Amatic, Endorphina, Betsoft and Rival Gaming, are just some of the providers cooperating with Casinia Casino. Do you like what you have read so far? Then you probably know what needs to be done. Create a user in the casino and start playing! It’s really straightforward to make an account, and it doesn’t take long at all. All you need to do is to click the registration button, then choose a username, password, a promotion code if you have one, enter the email you have, choose a currency and the country you are from. After that, you need to agree to certain terms and conditions etc. and then fill out some additional information. It’s not really any more or any less compared to any other casino out there. If the bonus offer we talked about earlier sounds interesting we recommend that you take advantage of it when making your first deposit at Casinia Casino. It’s important that you do so, because if you make a deposit first without using the welcome bonus and start playing, then you will miss out on the welcome bonus. The reason for this is because once you start betting, you’re no longer a new player, which is understandable from the casino’s perspective. Therefore we think you should sign up and activate your bonus right away! Casinia Casino is a new addition on the gambling market, and they started in 2017. They have managed to get popular in a short time, and they deserve all the recognition they have gotten. They have a nice welcome bonus that is available for only new players, and you can find promotions there as a regular player too. Good customer service is present, and several payment options are available. A good selection of games can be played by several known providers, and you can decide if you want to play on your computer or phone.